Nitya and I have recently returned from Quito, Ecuador, where we had the opportunity to visit schools, NGOs, communities, and beautiful landscapes. The purpose of our trip was to work on a BUILD: Latin America and Libraries Without Borders’ project called the Koombook Program, which aims to provide portable digital libraries to vulnerable communities. On our last day, Nitya and I visited a beautiful secondary school in the province of Imbabura. 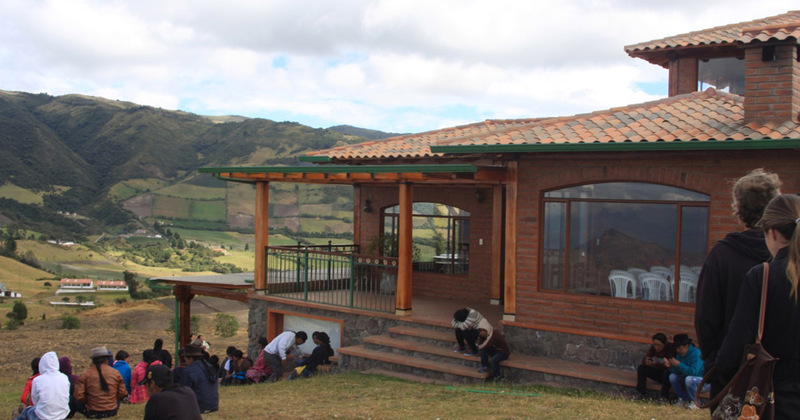 The school, Seminay El Legado, is located on the top of a mountain and has an impressive 360-degree mountainous view. With beautiful infrastructure, enthusiastic professors and diverse resources, this school is a blessing to the vulnerable province of Imbabura. However, the school still lacks technology and reliable internet connection, which is something we plan to address through the Koombook Program. We also visited three near-by primary schools. These schools were located in remote areas and had very scarce resources. Some of the schools had one teacher for all grades and, at times, were located 2-4 hours away from teachers’ homes. However, it was inspiring to visit the schools and speak with teachers and community members. Despite the obstacles that the people in the community experienced every day, they were motivated and showed receptiveness towards our project. Nitya and I recognized that the schools had a great need for the technology and information that the Koombook Program offers. At Seminay El Legado, we discussed with teachers and coordinators about the program’s potential use and implementation. They told us that it would be better to implement a Koombook Program in each school, since near-by schools are hard to reach. The teachers were also interested in using the Koombook, not only for digital learning, but also as supporting material in all subjects. They emphasized that the program would greatly help indigenous students prepare for university. Specially since many of them are currently dropping out due to digital illiteracy. It was a gratifying and enriching experience to travel to Ecuador. This opportunity didn’t only open my eyes, but also encouraged me to make the most out of the Koombook Program. I am very excited to continue working on this project next semester, and I know that the program will change the lives of many Ecuadorian students.